There is relatively little available about eighteenth century Jamaica written by women, unless you count the diary of Lady Nugent, written on the cusp of the nineteenth century, but recently memoirs of nineteenth century Jamaica have started to appear. I reviewed Diana Lewis’s memoir A Year in Jamaica last year. A Lady in Jamaica 1879 is the account of her visit to the island written by Martha Jefferson Trice and edited by Jasper Burns. As may be guessed from her name Martha, who was born in 1855, came from an old established Virginian family and was a descendant of the sister of Thomas Jefferson. Martha was very well educated, and a published poet, but her family life had been severely affected by the American Civil War and the death of her father. After the death of her mother she and her sister Margaret took in children as boarding students while their brother Dabney ran the family farm, all assisted by their youngest sister Lucy. Martha suffered from serious ill health, although the cause is not entirely clear, she appears to have had an abscess on her stomach that would not heal and was sent to Jamaica in an attempt to cure her. The trip was paid for by relations and she went to stay with some old family friends, the Evans whose daughter Sophia was five years older than Martha and whose son St George cherished romantic intentions towards her that were definitely not reciprocated! Although Martha’s health did improve somewhat as a result of her trip, when she returned home her family were caught up in a typhoid epidemic and both Martha and Margaret died tragically young. But the account Martha left behind has given her a kind of immortality. She began her diary at the end of January 1879 with her trip to Washington and New York, the ‘great Central Depot was one of the largest buildings I ever saw’, and then she boarded the Etna where she was disappointed to find that her cabin was ‘about half as large as our little dressing room and has four berths’. She was however advised by the Captain to stay on deck as much as possible to avoid sea sickness. She described her fellow passengers vividly, ‘the nicest are two Jews’ one of whom had been born with only three fingers on his left hand ‘and no right hand at all’. He was a commission merchant named Lazarus and the other man whose name she forgot was a native of Jamaica who grew bitter wood, quassia and china wood. Sea sickness overtook all the passengers and Martha found that another abscess had formed making her really ill. She improved as the weather grew warmer however and arrived in Kingston on February 7th where she discarded her flannel underwear! Post emancipation Jamaica made a vivid impression on Martha who wrote about a very wealthy girl ‘coal black’ who was going to marry a recently arrived Scot – ‘my Virginia born eyes cannot get used to this equality of the races’. Her reaction to the local language was also unfavourable ‘The lingo of the negroes and children here is perfectly heathenish and unintelligible’. Although the Evans were kind to Martha, initially it was not the most cheerful house for an invalid as her cousin Sophy was also unwell. The book combines Martha’s diary entries with the letters she wrote home and paints a vivid picture of life in Jamaica. As the island air improved her health Martha toured the island, rode out with her cousin Sophy and spent difficult hours dodging the unwanted attentions of her very bad tempered cousin St George. Martha was constantly homesick for Virginia and worried that she might never see her family again. She returned there in July 1789, taking her cousin Sophy with her. Lucy Trice went to Jamaica later that year to be bridesmaid when Sophy married William Panton Forbes at Spring Garden. 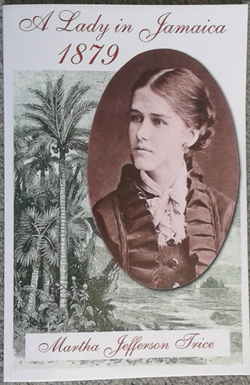 Martha was never well after her return and died in July 1880, however her lively personality and gift for description have ensured that she will be remembered for her memoir of nineteenth century Jamaica with her vivid descriptions of people and places. Martha Jefferson Trice, Jasper Burns ed., A Lady in Jamaica 1879, Pietas Publications, Waynesboro, Virginia, 2013. 73 pp. illustrated with contemporary photographs. ISBN 9781494308124.